"I think that's what he needs." The New York Knicks, and their championship-starved fan base, are wishing and praying that two-time Finals MVP Kevin Durant chooses their franchise as a free agent this Summer. It's a lofty dream considering the Knicks are currently sitting near the bottom of the NBA with a 10-31 record, while Durant's Warriors are once again the favorites to win it all for the third straight season. 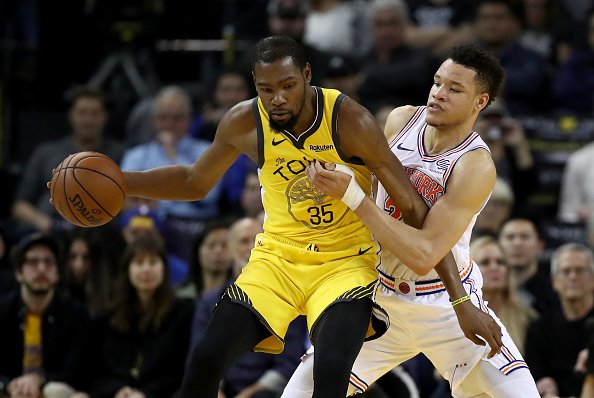 Whether or not KD leaves the Bay Area remains to be seen, but Knicks legend Walt "Clyde" Frazier thinks the nine-time All-Star could catapult himself into the GOAT conversation if he delivers a title to NYC. "I think that's what he needs. Especially if the Warriors win this year, I think he'd be looking for a different challenge," Frazier said, according to the New York Daily News' Stefan Bondy. "I don't know a better place than New York where he can do it. Where else could he go to get what he's looking for, to be the best in the game? If he could bring a title to New York, that's going to catapult him with Jordan and LeBron, I would think." Frazier has been critical of Durant's decision to join Golden State in the first place but he clarified his comments on Tuesday, telling Bondy that he "meant no disrespect" and reiterated that KD is "one of the best in the world, right up there with LeBron, and that he's probably going to be the best in the game."